Three Barrow players made the Scratching Shed Division One Dream Team based on their performances in the Furness Building Society Northern Premier Cricket League (incorporating Readers Cricket Balls). Barrow suffered the disappointment of missing out to Leyland in a thrilling title race but gained consolation as Jonathan Miles, Greg Platten and Chris D'Leny all represented the runners-up in the mythical selection. The top four amateur bowlers, based on wickets taken. Leyland captain David Makinson leads the Dream Team having captained his side to the championship. The best all-round professional was a close-run thing but was won by St Annes' professional Dinuka Hettiarachchi who scored 354 runs and took 94 wickets (1,294 points). 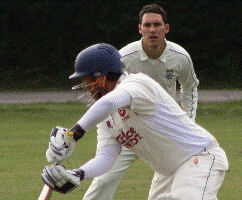 Hettiarachchi edged out Fleetwood's Matthew Frith who enjoyed a highly successful debut season in the league with 849 runs and 42 wickets (1,269 points). Kendal's Ross McMillan was third with 659 runs and 59 wickets (1,249 points), Darwen pro Mohammad Zaman Khan fourth with 965 runs and 28 wickets (1,245 points), while Barrow's Pasan Wanasinghe was fifth with 480 runs and 74 wickets (1,220 points). 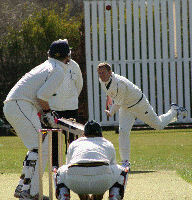 The leading wicketkeeper was D'Leny with 35 dismissals. 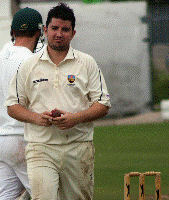 The top four amateur batsmen were Atiq Uz-Zaman (927 runs), Miles (878), Platten (736) and Preston's Adam Parker (702). The four amateur bowlers to reach the 50-wickets mark for the season all won selection for the Dream Team. 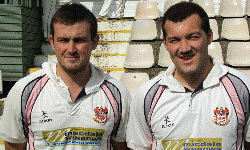 Spin twins Ben Simm and Chris Miller led the way; Simm took 61 on his way to a new Lancaster record and edged out fellow off-spinner Kendal's Chris Miller (60) for the Castle Award. 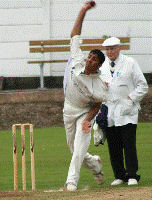 Pacemen Richard Gleeson (Blackpool) and Kamran Anwar (Darwen) each took 50 wickets in Division One matches. Gleeson earned Cumberland selection late in the season after another impressive campaign while the teenaged Anwar impressed many good judges with his all-round displays. Four Blackpool players made the Scratching Shed Division Two Dream Team based on their performances in the Furness Building Society Northern Premier Cricket League (incorporating Readers Cricket Balls). The top four bowlers, based on wickets taken (top five if one is top all-rounder). In the event of a tie between the last two categories wickets shall count as ten runs. Leyland captain Chris Dovey the Dream Team having captained his side to the championship. 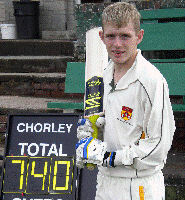 The top batsmen were Daniel Hall (Leyland) with 846 runs; Chorley's Stu Naden (740); Kendal's Donovan Du Plessis (603), Milner (582) and Blackpool's Adrian Darlington (581). Three of the top four amateur bowlers all reached the 50-wickets mark for the season to win selection for the Dream Team. Ross Parker and Kevin Reid captured 105 wickets between them for Blackpool, Parker sharing the Castle Award with Milner on 54 wickets. In a close-run battle for the final bowling place Leyland's Steven Pallett, who in 2009 captured his 500th Northern League wicket, took 38 wickets and edged out Darwen's Christian Davies (37) and club-mate Tayyab Afsar (35). St Annes' Adam Taylor (518) edged in as fifth batsman due to Milner's heroics, earning 518 points to Darwen's Christian Davies (370 points).